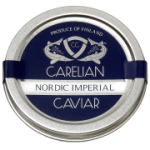 Carelian Caviar is a sustainable – and 100 % natural – premium product, produced in crystal-clear Nordic waters on a sturgeon farm in Finland’s beautiful North Carelia water district. 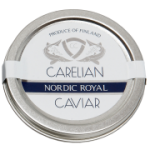 Our highest quality caviar is a fresh low-salt variety with a sublime, complex flavour. It is a real taste sensation and so best consumed neat or with mild accompaniments, such as blinis and crème fraiche. Enjoy it with champagne. This lightly salted caviar has a clean aroma, buttery flavour and long, intense aftertaste. Versatile and indulgent, it makes an ideal topping for luxury canapés and delicate starters. Try it with salmon sashimi or a succulent Norwegian lobster. This rare pale black caviar is only produced by 5 % of the sturgeons. Beautiful and delicious, it has slightly smaller eggs than our other varieties and makes a perfect garnish for exclusive starters. Try it with roast ratte potato, crème fraiche and butter. Carelian Caviar has become the first caviar to be given an SRA Approved Supplier badge by The Sustainable Restaurant Association, meaning it’s now possible to enjoy this luxury product with a clear conscience. Headed up by President Raymond Blanc, The SRA is a non-profit organisation that helps restaurants become more sustainable and diners make more sustainable choices when eating out. It vets and rates all suppliers and restaurants before listing them on its website, http://www.thesra.org.